Remington 6's Story . . . This has been a really loooooong winter, but so has my wait for a forever home. Is it my looks? I may not look like a typical Springer, but I am very handsome and I have my charms. Smart, too. I heard a rumor in my training class that I deserve “most improved”…possibly class valedictorian. My foster mom deserves some of the credit because I have been training her as well. Ever since she learned to move my bed upstairs at night—instead of isolating me in a crate on another floor—I’ve had no problem answering her bedtime call. I’m an excellent companion: quiet if you work at home, thrilled with the shortest car ride, ready to stretch out in your lap while you watch TV (unless you yell at sports teams). I love people of all ages so I may not be the best guard dog, unless you are threatened by a steam iron. The hiss of a steam iron will bring me running to your rescue so I can bark and put that thing in its place. I love my foster family and they love me. But, now that spring is almost here, my hope for a forever family is blooming anew. Happy Valentine’s Day from Remington!! Remington is halfway through his obedience class and had the best “sit-stay” of his group last week…a major break-through as he had been reluctant to leave his foster mom’s side during the first three classes! Fellow dog owners in the group gave him a rousing cheer for his accomplishment. Remmie has also added “back” and “stand” to his repertoire of commands. However, “recall” is still a work in progress for this love…unless his foster mom asks if he wants to go for a car ride. Then, he happily and proudly will sit in the passenger seat for the shortest of trips. Remmie’s sensitivity to different noises adds to the puzzle of his unknown past. Fireworks or anything that sounds like gunfire terrifies him. On New Year’s Eve, someone set off fireworks very close to him. That experience caused him to resist a walk after dark for a few weeks. He enjoys the sound of a hair dryer, but the hiss of a steam iron brings him on the run from anywhere in the house so he can circle and bark at the iron. He does not want his foster mom to take out the ironing board, which is just fine with her! With his current foster family, Remmie has had a variety of interactions with other dogs. There is the group obedience class he’s currently taking, and, he enjoys meeting dogs on the street. He goes to a dog park on weekends, though he will guard a toy when he finds one left for all dogs to share. This guy likes the occasional company of other dogs and is not dog aggressive but, in looking at his overall behavior with other canines, his foster mom feels Remington would thrive best in a home where he was the only dog and would have lots of individual attention. Remmie remains on a low dose of medication to help him handle his occasional anxiety. His foster mom is firmly convinced that, with the right family and time, Remmie could be weaned off of this entirely. Remmie’s a quirky individual in many ways but still a lovable and extremely smart pup! He loves people of all ages and is gentle with the neighbor kids he’s meeting. He will do best in a home with adults/older children who will keep him physically and mentally busy. His folks should also be willing to share their laps with a sixty pound dog…and not like to iron! Ask about meeting him if you think Remmie is the dog for you! Remington is very hopeful that the new year brings him a new, and permanent, home. In the meantime, his foster mom has enrolled him in a basic obedience class. Remmie already is a master at “sit”, “lie down”, and “paw”, but needs to improve “come” and “stay.” His mom particularly hopes to improve his recall, as this very clever dog is able to sense and delay her attempts to bring him into his gated area or the house. A dog certainly doesn’t want to quit chasing snowflakes! Remmie has adjusted well to the social life of his foster home. At a party with 40 guests, he saw everyone as a friend and a potential food dropper. He didn’t bark or jump on a single person and took all of the petting and hugging offered to him. He did wallow in the bed with the coat pile, which even the guests thought looked like the world’s biggest downy dog bed. Always a lover, Remmie has found a new delight…lap dog! This 60 pound dog, about the height of a Labrador retriever, will now stretch out in his foster mom’s lap with his legs hanging over the sides of the chair. Gentle stroking will put this big fellow into a deep snoring sleep. If you have an open heart and an empty lap, Remmie could help you fill those spaces. The long Thanksgiving weekend gave Remington many opportunities to celebrate with his foster family. Once a starving stray, he was more than willing to participate in the annual 5K Trot for Hunger in Washington, DC, on Thanksgiving morning. Check out that new website picture!! He proved to be a natural runner…steady pace, straight run on a short leash, and an eye for the holes that would allow his team to move forward. He also had no problem with being part of a crowd of thousands. In fact, his only flaw…if you can call it a flaw…was that he wanted to stop and say thanks to the crowd lining the last block before the finish line since they were obviously there to cheer him on. Back at home, he relaxed from his exciting morning by doing several laps around the yard. Thanksgiving also brought a houseful of company from ages 13 and up. Remmie was initially shy around these strangers and tucked his tail and hid until he reassured himself that these were friendly, if large and loud, people. After that, he approached them for a much-loved head scratch. Remmie also made his first visit to the local dog park. He greeted people and dogs appropriately and was delighted to engage in group runs. He also came when called which made fellow dog owners declare him “the best behaved dog” in the park. Coming when called, however, is a challenge at his foster home, where a call to come indoors often means that his foster family is heading off to work. This smart fellow has that routine figured out! The dog with the tail remains a work in progress, but one that will be well worth the effort for a family who can keep him physically (notice how he relaxed from doing a 5K run!) and mentally stimulated. In spite of his need for activity, Remington would also be very happy to lie beneath his very own Christmas tree and receive as many head scratches as his forever family is willing to give. A newly adopted dog and his family can be like a new shoe and a foot; sometimes the fit just isn’t right. Such a misfit prompted Remmie’s return to MAESSR. Unfortunately, his exercise and training needs rubbed against a new family member’s health concerns, an aging resident dog and a kitty that didn’t care for rough play with Remmie. Remmie’s now in a different foster home and doing well again. His foster family reduced his anti-anxiety medication and hopes to wean him off it entirely. He loves running around a big back yard and protecting it from squirrels, but he still will lie calmly next his foster family in the house. He sleeps quietly in his crate at night. Some training has resumed. His foster family is working on his jumping, which he tends to do when he gets excited. They also are working on recall. Remmie is so eager for a human playmate that, once outside, he will run up to the door repeatedly and do a little open-the-door dance and whine, but not to come in. He wants someone to come out and play! Anyone who adopts Remmie will never have to go into the bathroom alone either! Remmie is highly intelligent as well as having high energy, so he needs both mental stimulation and exercise. His foster family is beginning to introduce the games used by his original foster family, such as “picking the hand” or “box hiding a treat” or playing “find the ball.” Remmie is using a treat ball that he has to nose or paw to get a reward. Yes, he does like his treats, particularly peanut butter or cheese! Remmie would be a great addition for any family that is looking for an excuse to get more exercise and keep off those extra holiday pounds. He’ll get you moving and thinking out in the yard. He’ll entertain as he scopes out which box you hid his treat under and then he’ll settle peacefully at day’s end as tired companions do. Remmie’s ready for an active family with or without younger dogs and without cats. If this mix is one you can offer this handsome boy, ask about meeting Remmie ASAP. Update 08/06/2014: “And, in appreciation to his people, he can and will give hugs around your waist.........too precious and genuine a gesture to consider redirecting." “Summertime and the livin' is easy.” So goes the song and so goes Remington’s summer too. During the sunny days this summer, Remington is enjoying running in his yard. On not-so-sunny days, he splashes in the water in puddles from rain. He loves all the attention he gets, rain or shine! And, in appreciation to his people, he can and will give hugs around your waist..........too precious and genuine a gesture to consider redirecting. Would that all dogs took to crates as Remington does. He is very crate trained. Recently his foster mom asked if he wanted a treat. He tilted his head like, “Did I hear ‘treat’?” His mom repeated, “Want a treat?” He ran to his crate and barked to tell her to hurry there with the promised reward. She had to laugh. She was going to work on his “give paw” trick but he switched up the game............tooo funny! This handsome boy is getting brushed a lot and holds still a bit better each time. He seems to watch birds in the trees in the yard a lot. Sometimes when his foster mom calls him, he acts like he is lost in watching everything around him. But, that’s what summer’s about, isn’t it? Remington’s having an idyllic summer. The only thing that could make it any better would be if a family asked to meet him............a family who likes summertime as much as he does and would love those special hugs he gives....... :)). Update 06/29/2014: “Another 'toy' he's being introduced to is a Rubik's cube." While patiently waiting for a family of his own, Remington continues to thrive in his foster home. He has a large fenced yard to play in but isn’t a self-entertaining dog. Lucky for him that he gets lots of attention from his human housemates. His foster mom, in particular, spends time daily, playing games with him to keep his mind active and to broaden his skills. One game involves Remington searching in the house for a tennis ball. Since he likes most treats and gets one when he finds the ball, this is a favorite game. He loves to run outdoors too when someone is throwing a ball for him. He’ll return with the ball but doesn’t always want to give it up, so the game right now is to toss another ball which prompts Remington to drop the first one and go for the second. The fun continues as long as he returns with a ball and drops it. Squeaky balls make this even more exciting for him! Another “toy” he’s being introduced to is a Rubik’s cube. Learning to scratch at it and to turn it over is a first step toward developing skills for service work..........again, something else to challenge this boy’s mind.........and fun at the same time. Remington is a pretty compliant dog, wants approval, and will do almost anything asked of him once he understands the request. He has a very soft temperament, may get his feelings hurt and crushes under a firm “no.” As with most Springers, he responds well to positive training, especially when his people invest the time to build up his confidence. Toys are also being used as a distraction for Remington. He continues to be obsessed with shadows at twilight and chases them if out in the yard alone. Coupled with medication to assist with this, his foster mom uses a toy to attract his attention indoors. Recently another mind-expanding experience for Remington involved a group of 4-H youth who were working toward earning their dog patches. Remington was their “patient” as they practiced 1st aid skills for dogs, such as assessing the need for CPR and bandaging a paw. He wagged his tail throughout the session and eventually just sat down after a while. When it was time for the 4-H leader to speak to the group, Remington listened too. He was having a good time!! When it comes to other dogs, Remington likes everyone. However, he doesn’t always interpret another dog’s body language correctly. If he gets growled at, he may not know he should simply back away and give the other dog a little more space. To help improve his social skills with dogs, he is going to doggie day care for a few hours at a time. He’s done OK there and will be welcomed back. Another place this tall boy is welcome is at the groomers. Bathing and brushing has gone well at home, but he got to go to a shop for the works once too. The groomer commented that he was the only dog that day that didn’t bark while waiting in its crate.....yeah for Remington!! Of course, he does as well with crating everywhere else too.....for meals at home, for riding in a car, etc. Update 04/15/2014: “Remington wags his tail and is very happy to share his outside time with all people." Spring is upon us, especially in Remington’s North Carolina foster home, and this guy is enjoying the warmer and sunnier days. He likes the birds landing in HIS yard! Remington wags his tail and is very happy to share his outside time with all people. He also loves to explore new places. What fun he thinks it is to see and smell the new sights! He’s a happy boy and has been earning treats for the “sit” and “wait” commands. His “come” when called is really working better—happy, smart boy! Remington is good with all 2-legged folks, good with other dogs, good with cats……….and he has a wonderful tail! What more could you ask for in your house? Are you ready to welcome this handsome love into your home and your heart? Update 03/18/2014: “This active, handsome fella should be the envy of us all. He is not gaining weight even with eating his full share of dried food and tons of cookies each day." While the rest of us may be looking forward to spring and April showers, Remington really doesn’t like the cold rain and would definitely prefer to continue to play in the snow! This active, handsome fella should be the envy of us all. He is not gaining weight even with eating his full share of dried food and tons of cookies each day. Remington plays and loves to be petted by his foster family, but ignores kids who might be in the yard with him. He seeks zero attention from them. He seems to run full out in the yard and then freeze in the middle, lost in his mind. Is he dreaming of future flowers or past snowmen? Remington continues to flourish in his new foster home and his foster family and MAESSR team feel he is now ready to go to his forever home! Handsome is as handsome does. Are you ready to welcome this love of a dog….and his tail…into your home? Remington’s progress continues in a new foster home. The opportunity to further his training with another very savvy and patient family was one he couldn’t miss. He’s settling well as he becomes acquainted with new people and new canine companions. While he still does some shadow chasing, an inexpensive anti-anxiety medication is helping him. This handsome guy with the tail is working on gaining weight, gaining confidence with adults and learning basic commands. MAESSR’s young man loves the outside during the day and has favorite toys that he carries around. Remington also loves cookies and his mealtimes. Love seems to be the word to describe this wonderful Springer. His “new beginning” is well underway and should lead this former stray to the good life he deserves. Check back to follow his progress. In his own time, Remington will be ready to share his love with a forever family……..maybe yours? Update 12/05/2013: "Would you like a snuggle-bug while you read or work and someone to share Sunday breakfasts with you?" WHAT A SWEETHEART! Remington has been showing his true Springer genes. ♫ These are a few of his favorite things! ♫ He might snuggle with his foster mama on the sofa while she is reading, he might nuzzle onto his foster daddy's lap while he is on the computer, or he will sometimes snuggle with his foster sister on the bed in the office. He absolutely loves head scritches! Remington is such a gentleman. He sits for his meals, he sits for treats and will "lie down" when told. He hasn't counter-surfed since the bacon incident last month and politely waits for his egg on Sunday mornings. He does get excited at new visitors, but he is learning "off!" He might not be good for little ones in the house as he gets so excited he could knock them over! The guy with the tail still loves his morning and evening runs around the backyard, but he doesn't bark at the neighbor's dog, even though she wants to get in on the play time action. He has been riding well in the car, too. On short trips, he is thrilled just to watch the world go by. For longer ones, he lies down and takes a snooze. Speaking of that tail, Christmas tree vs. tail, tail won! Remington also sometimes has trouble keeping track of it near fences and outdoor obstacles. His foster mom says she may know why Springer tails are docked! Are you an adult family or one with older children? Would you like company on your car rides? Would you like a snuggle-bug while you read or work and someone to share Sunday breakfasts with you? Remington is just the fellow to spend the holidays and the rest of his life at your home! 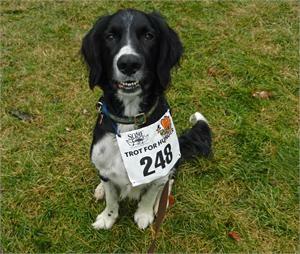 Update 10/29/2013: "He’s a tall boy who would be great as a daily running partner since he has the stamina and speed." Remington moved to a quieter foster home to receive more one-on-one time. His foster mom finds him to be an absolute sweetie! His eye infection has cleared up and with just one more whipworm treatment to go, Remington should be super healthy. One would never know those pesky buggers are in him because he is so happy-go-lucky. He also is gaining a bit more weight; just a few more pounds and he will be perfect! This boy is a runner at heart. He’s made a perfect trail around his backyard and will even try to get in a jog while on a walk with his foster family. He’s a tall boy who would be great as a daily running partner since he has the stamina and speed. Remington also is happy to just lie by his people’s feet while they log miles into their fitness pal app! An attempt at counter-surfing has occurred just once, but this was because Remington was lured by that cruel temptress, bacon! With a simple “off,” he was down in a split second. Because his nose could reach the top of the dinner table, his family had been crating him at dinnertime; but now he lies down and waits by his family’s feet until they are finished with their meal. He knows that a bite of chicken might land in his bowl if he behaves like the gentleman they know he is. Good boy! Remington gets along great with his foster sister even though she can be grumpy in her old age. He likes to play with toys but hasn’t mastered fetch yet – the love of running beckons him and is too great to give up! He also is great at bath time as he’s so easy to bathe and dry off. If it’s time for crating, he does that wonderfully, too. In fact, his foster parents think that Remington enjoys his crate as his “time-out” between his runs through the backyard! Looking for a running partner? No doubt, this sweet boy would fit right in with an active family! This tall, lanky, and underweight boy was picked up as a stray in South Carolina. Luck was on his side as he was pulled and went into a temporary foster home before transport to Virginia. Remington is either a poorly bred Springer Spaniel or a mixed breed with a high concentration of Springer genes. He has all the wonderful Springer traits, so, that is what counts! Remington was obviously an outdoor boy before coming to rescue. With his foster family’s guidance, he quickly has learned not to have accidents in the house. He is crate trained and walks fairly well on the leash. In true “Springer” fashion, Remington does jump up to greet new people. His foster family is working on correcting that behavior. Because he is such a sweet, loving boy, Remington should fit into any family that wants to spend some time bonding with him and helping him understand how to be a family member. He will be well worth the investment of time! This former outdoorsman loves to run around his foster family’s large back yard. He chases butterflies, leaves, shadows, and just generally has a great time outside. He will attempt to counter-surf when inside, but he’s a smart boy who’s quickly learning “four on the floor.” Remington is a high-energy boy and would be great for someone who wanted a running partner. Would you like to help Remington complete the transition to being part of a loving family? A small amount of time invested in shaping Remington’s behavior will reap huge rewards in the long run for his adopting family!